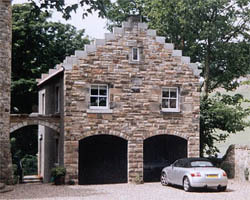 Left: Example of square and sneck reclaimed rubble walling with arched garage doors and crow steps up the peam on a painting studio for Jack Vettriano . 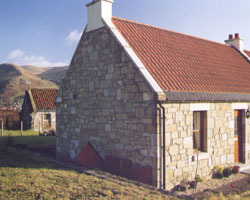 Left: Demolished farm steading reinstated using reclaimed random rubble for walling. 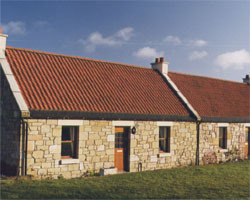 Above: The steading was renovated into 3 houses. 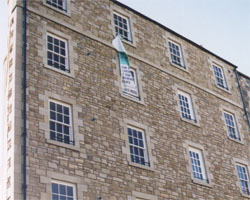 This was part of the new built renovation. 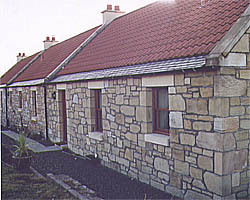 Left: Example of 100mm random square and neck with rubble dressed quoins, cills, lintols, rybats and string courses.